Any workplace can benefit from investing in Health and Safety labels; they’re a perfect way to prevent accidents in the workplace, to signpost potential hazards to workers and ensure anyone in your work environment or site know of Personal Protection Equipment (PPE) regulations or restricted areas for unauthorised personnel. Today, we’ll be looking at five different types of Health and Safety Labels, all available to purchase here at Label Bar, which will be perfect for your business’ needs. Fire and Alarm labels are required to signpost fire call points, fire extinguishers, fire hoses and fire points located around your work environment. They are specifically designed with simplicity in mind so that, in case of an emergency, workers can quickly identify the necessary location of safety equipment and warning devices. These health and safety labels are self-adhesive and can be applied to walls above fire extinguishers and fire call points so these areas can be quickly identified; they’re also highly durable, made from polyolefin. Mandatory Labels are a type of health and safety sticker which go hand in hand with PPE Supplied in your work environment. Being able to adorn certain areas with these health and safety labels can ensure workers know when they need to wear correct protective equipment. At Label Bar, we supply a large range of mandatory health and safety labels, including eye protection, hand protection, high visibility clothing, face and welding masks, ear protection and heavy lifting labels, all of which safeguard your employees by reminding them when they should be wearing the correct equipment, as well as making sure you’re following Health and Safety legislation. Prohibition labels are excellent at reminding both staff and customers of restrictions in place in your workplace. The most popular and recognisable of these health and safety labels are “No Smoking” signs, but they come in a variety of different forms, including “No Naked Flames”, “Do Not Touch” and “Not Drinking Water”. These can be placed in a variety of different areas, as they are self-adhesive and durable, and we also supply them in small and larger sizes so they can be placed in large areas and easily visible, or in confined spaces such as bathrooms or storage cupboards; prohibition health and safety labels are popular because of their simplistic design. Adorning hazardous substances or dangerous areas in a workplace can go a long way to reducing accidents and harm in your business. They ensure everyone is aware of potentially toxic, poisonous or flammable materials, which means substances or equipment are handled correctly with the proper PPE worn or in the correct environment, perhaps free from naked flames. 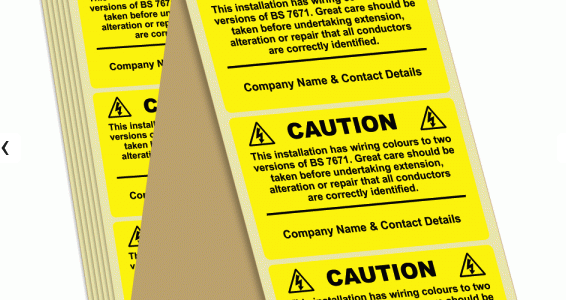 ‘Warning’ health and safety labels work in much the same way, identifying potential electrical hazards to workers, such as equipment or machinery that contains live electrical parts, or areas with high voltage. Both Hazard and Warning health and safety labels are a perfect preventative of accidental electric shocks, fires or injuries from dangerous substances. At Label Bar, we supply a huge range of different Health and Safety labels and stickers; be sure to browse our range today and, if you have any queries about our products please don’t hesitate to contact us.